Appointing an ‘EV Champion’ is one of a number of ways that local authorities could encourage EV take-up and expand charging infrastructure. So says the Renewable Energy Association, which has launched a free guide to such measures and the support available to councils. 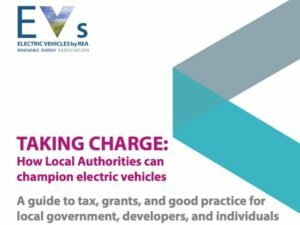 The ‘Taking Charge: how local authorities can champion electric vehicles’ guide, available here, calls on councils to appoint an ‘EV Champion’; a councillor who can be a main contact point for the public and developers who can help navigate the process of charging infrastructure being developed. It also provides details of tax relief and the grants available for local authorities to deploy EV charge points. Research released earlier this year found only five local authorities had taken advantage of the Government’s £4.5m funding pot for EV charge points despite funds to provide thousands of extra points having been available since 2016. The report also urges councils to commit to purchasing EVs as part of their transport fleet and to make the ‘Milton Keynes Promise’, to better inform residents of existing locations, and guarantee that on-street charge points will be installed next to the homes of those who operate an EV. This should be backed up by a dedicated EV webpage where residents can request charging infrastructure. And the REA says new ‘Energy Boards’ could investigate ways of saving money by coordinating EV roll-out, switching to renewable energy providers for their properties, and investing in solar and energy-from-waste projects.